NEW YORK (CNN) -- The ongoing financial crisis could put public transit systems nationwide at risk of defaulting on more than $2 billion in loans backed by troubled insurer American International Group, an industry advocacy group said Thursday. 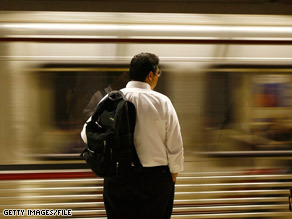 A man waits for a subway train in Los Angeles, California, in June. The problem stems from "lease-back transactions" -- made from the early 1990s through 2003 -- in which transit agencies sold equipment to banks and then leased them back. "Thirty-one transit agencies nationwide used these leverage lease actions to finance assets," said Rob Healy, vice president of government affairs for the advocacy group American Public Transportation Association. He added that one of the requirements was that securities used to make the lease payments were guaranteed with an AAA rating, which AIG provided in most cases. But AIG's rating was downgraded after it accepted a federal government bailout in September, allowing the banks to demand early payments. The heads of public transportation agencies in 25 cities and 17 states sent a letter to Treasury Secretary Henry Paulson on Wednesday asking for the federal government to act as a backer to prevent banks from collecting millions of dollars the agencies cannot spare. The letter, signed by heads from agencies in New York, Massachusetts, Pennsylvania, Georgia, Texas, Oregon, California, New Jersey, Missouri, Chicago and metropolitan Washington, calls on the Treasury Department to act under the Emergency Economic Stimulus Act to prevent "significant additional costs and losses to the transit agencies, and, ultimately, to the taxpayer." Terry Matsumoto, chief financial services officer of the Los Angeles County Metropolitan Transit Authority in California, said the Metro could be forced to make $165 million in early payments if the government does not intercede. "The last thing we'd like to do is cut service since ridership is at an all-time high," he said. "But we would have to do that, in addition to raising fares and cutting future capital programs" if forced to make early payment on lease-back transaction loans. New Jersey Transit would have to make $150 million in early payments, spokeswoman Penny Hackett said. "The federal government has an opportunity to protect commuters and taxpayers by addressing the economic exposure of mass transit agencies such as NJ Transit that resulted from lease-back transactions with AIG," said Kris Kolluri, the commission of the New Jersey Department of Transportation. The Washington Metropolitan Area Transportation Authority, which serves the District of Columbia, Maryland and Virginia, could be forced to make $400 million in early payments, officials said. The agency is in court with KBC Group of Belgium, which has requested $43 million in early payments. The hearing began Thursday and will reconvene Friday, agency spokeswoman Candace Smith said. AIG spokesman Nick Ashooh said that AIG is still insuring the agreements, but because they've been downgraded, the deals have been put in default, which allows the banks to seek early payments. Ashooh said that AIG's role has been very passive and that the issue is really between the transit agencies and banks involved. "These securities are incredibly sound," Healy said. "It's really the loss of the rating that has caused the situation. We really believe that if Treasury could step in and back the securities, it could eliminate risk at no cost to taxpayers." Calls to the Treasury Department were not returned in time for this report.